Numberlink puzzles have proved popular recently in various guises, including Flow Free and other apps on mobile devices such as the iPhone. There are quite a few such apps available, but none of them force a unique solution on the user (and generally the puzzles do indeed have many different solutions), which when you’re playing against a computer that grades you isn’t necessarily a problem since you can at least be marked correct/wrong automatically. For a logic puzzle solver, such vague puzzles are perhaps a bit disappointing because you will reach a point during solving where you can’t eliminate any options because they may all be valid, despite being contradictory. 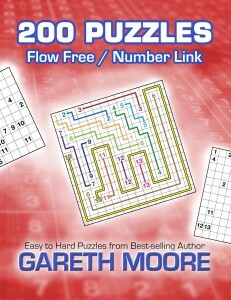 I’ve made a printed book of 200 of these Flow Free puzzles – you can get it from Amazon.com (currently $5.36) or Amazon.co.uk (£3.95) – and they’re actually quite fun to solve despite the multiple solutions (not all the puzzles have multiple solutions, but some do). 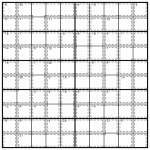 Unlike traditional Numberlink the puzzles include an explicit rule that every cell in the grid must be used, which eliminates a lot of potential solutions and means the puzzles usually require some thought. 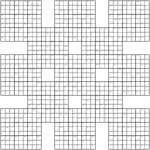 But such multi-solution puzzles are not the kind of puzzle I usually post, so I’m going to stick to logic puzzles with unique solutions on this blog. It turns out that if you allow lines on a Numberlink puzzle to wrap around one edge and come back on the other – so if a line goes off one end of a row or column it comes back on at the other end of the same row or column – that the puzzles get very difficult very quickly. 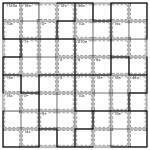 In fact, even at 5×5 many such puzzles are very challenging. Once you get to 6×6, I have real trouble with them. Here’s a 5×5 and a 6×6 puzzle for you to try. Let me know how you get on! There’s no explicit rule that every cell must be used – but as a hint I can tell you that they are anyway. There’s a unique solution to each puzzle. A while back someone asked for some variant toroidal patterns on PuzzleMix, so I was just adding a couple of them to the daily puzzles section when it occurred to me that I could put up a few toroidal killer sudoku too, for a change. However I then realised that the code which creates the HTML will need editing to cope with toroidal regions, but I knew my PDF code was more flexible… and then I thought it would be great to mix this with some toroidal jigsaw regions too… and here’s the somewhat confusing result! A Toroidal Killer with Toroidal Jigsaw regions. Now if you enjoy this twisted beast let me know, otherwise I probably won’t make any more of them! No number can repeat in a dashed-line cage. 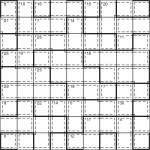 Another easy Calcudoku in terms of its logic, although this one is a little trickier in practice since it’s 7×7 and is toroidal, meaning that some of the regions wrap around the edges of the grid and continue on the square directly opposite on that row/column. Other than, just place 1 to 7 in each row and column whilst fulfilling the mathematical results given for each region. 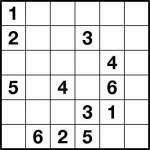 Unlike Killer Sudoku, you can repeat a digit within a cage (although of course not a row or column). Number Link at sizes up to around 10×10 may not necessarily be hugely challenging for everyone, but I bet you now that this puzzle certainly will be! Despite being only 8×8 it is really very difficult indeed. Or perhaps that’s just me – I’d love to hear that someone finds it easy, but I’m not expecting anyone to! 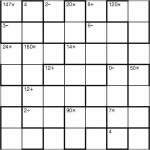 There is a unique solution to this puzzle, and it uses every square. However, the solution is unique even without the constraint that it uses every square. 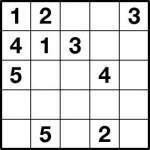 If you’ve played toroidal sudoku then you’ll hopefully understand how the wrap around works – when you go off the top of a column you come back on the bottom, and similarly (as stated above) for rows. If the basic rules of Number link itself confuse you, take a look back at a post a few days ago for an example. And good luck – I think you’ll need it! Sorry for the lower quantity of puzzles this past week – I’ve been working on completing a new book so I’ve had to focus on that instead, but next week I’ll hopefully get back up to my five-a-week average! I’m not feeling very inspired in terms of being too original right now so I thought I’d post a ‘regular’ 9×9 toroidal Sudoku, although this one is a little tricky through having only 14 given numbers to start from! 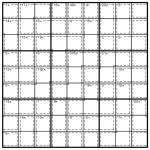 As my easy and hard puzzles attest, I’ve been doing a lot of work on really accurately rating Sudoku puzzles, something which I’ve only done in a more general way before on the basis of what logic was necessary to solve a puzzle – now I can do a much more detailed analysis of the number of simultaneous possible moves at any stage of solving the puzzle, what those moves are, and at what point in the solve process they’re required. I needed this new accuracy of rating for one of my new books that will be out later this year (actually pretty soon, at the start of July), shown left – Hard-as-Nails Sudoku. It has over 200 really-difficult puzzles – they start out tricky (more than 10 minutes to solve) and end up… well, even harder than the tough puzzle I posted last week! But at no point do they use any ‘unfair’ solving logic – they stick fair and square to logic that any solver could come up with themself, without help. And of course, no guessing is ever required. Anyway, it doesn’t take a complex analysis to see that today’s toroidal is not going to be on the easy side, given the low number of givens and the fact that toroidal puzzles really do twist things up in a difficult kind of way – so good luck! This puzzle certainly won’t be to everyone’s tastes, but it’s a double toroidal killer sudoku pro. Why double? Because there are toroidal jigsaw-shaped Sudoku regions, and there are toroidal jigsaw-shaped Killer Sudoku Pro cages. In other words, some of them wrap around the edges of the puzzle. It’s also an 8×8 puzzle, just to keep the Killer Sudoku (Pro!) logic fresh. 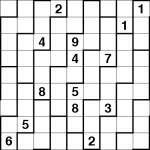 Place numbers into the dashed-line Killer Sudoku Pro cages so that when the given operation is applied the result is the stated number. For ‘-’ operations start with the highest number. Hints: As always with this sort of puzzle, if you shade in the 8 bold-lined regions first with different colours you’ll find it much easier to keep track of what you’re doing. Also, all of the regions (both killer cages and bold-lined regions) have rotational symmetry order 4 – in other words, the same pattern repeats 4 times; this might help! So far all of the “pure Sudoku logic” in my puzzles posted here has been pretty gentle. Well I decided that it was time to change that, but of course I wasn’t about to do that with a common garden puzzle! So I’ve applied some harder logic to this 10×10 Killer Sudoku with toroidal cages. Because this is a 10×10 puzzle I’ve kept the Killer Sudoku part very easy – there are plenty of single cages (with apologies to those who dislike these!) and although the maths goes a tiny bit higher the actual ‘Killer reasoning’ is straightforward. 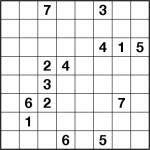 But the Sudoku reasoning itself is definitely tougher, in places. In summary, then, there are a few relatively unusual things here: the 1-10 Killer sums and 1-10 Sudoku; the toroidal cages; and the fact that this Killer requires tough Sudoku logic and so plays more like a 1-10 regular Sudoku than a 1-10 Killer… once you get going, that is! Here’s something that I’ve actually never seen before – Killer Sudoku with toroidal cages. Perhaps there’s a good reason for that, but it’s time to find out. This is actually a Killer Sudoku Pro, so it doesn’t just involve addition – but you cannot repeat a number in a cage, unlike in CalcuDoku. This is rated ‘gentle’, and none of the toroidal cages are very large so shouldn’t be too confusing to follow (I hope! ).